The Sun's rays are very direct in equatorial regions so the climate is very hot throughout the year, with temperatures usually above 25oC. The air is also calm and there are no prevailing winds. A tropical rainforest gets over 168cm of rainfall every year and it rains very heavily most afternoons. 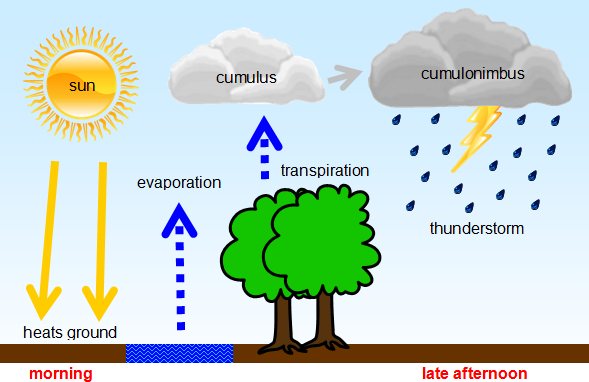 The Sun's heat makes lots of water evaporate from rivers/lakes and causes plants to transpire (sweat) moisture. Warm, humid air then rises and cools to form huge storm clouds. This is called convectional rainfall. The weather for each day of the year is similar. They are in the only area of the world where the seasons do not change.